China and France have agreed to hold the 6th China-France High-level Economic and Financial Dialogue in France on December 7. Chinese Vice Premier Hu Chunhua of the State Council and French Minister of the Economy and Finance Bruno Le Maire will co-chair the Dialogue. The China-France High-level Economic and Financial Dialogue, established in 2013, serves as an important platform for the two countries to communicate and coordinate on policies regarding economic and financial issues of strategic, overall and long-term significance. It has played a positive role in deepening bilateral practical cooperation in the economic and financial fields, strengthening communication and coordination on major international economic and financial issues, and advancing China-France Comprehensive Strategic Partnership. China and France have agreed to focus the 6th Dialogue on the macro-economic situation and global economic governance, trade and investment cooperation, cooperation and connectivity on agriculture, advanced manufacturing industries and major projects as well as financial cooperation. Q: The 13th Summit of the Group of 20 in Buenos Aires, Argentina has just concluded, which adopted the G20 Leaders' Declaration. What is China's comment on the outcomes of the summit? A: The 2018 G20 Buenos Aires Summit was held against the backdrop of fast-changing international landscape, rising protectionism and unilateralism and the world economy facing both opportunities and challenges. The participants discussed the major issues concerning the world economy, adopted the leaders' declaration, sent out the positive message and injected confidence and vitality into the global market. China congratulates on the success of the summit and appreciates the efforts made by Argentina which holds the G20 presidency. First, we remain committed to promoting global growth. All relevant parties agreed to step up dialogue and actions to enhance confidence and safeguard against downside risks. We reaffirmed our pledge to use all policy tools to achieve strong, sustainable, balanced and inclusive growth. We demonstrated our positive will to resolve differences through consultation and stay united to address challenges. Second, we remain committed to upholding the multilateral trading system. All relevant parties stressed that international trade and investment are important engines for economic growth, innovation, job creation and development and commended the outstanding contributions the multilateral trading system has made to promoting global growth. Meanwhile, they all said that there is still room for the multilateral trading system to make improvements and they supported necessary reforms of the World Trade Organization. Third, we remain committed to improving global economic governance. All relevant parties reaffirmed their commitment to implementing the G20 Action Plan on the 2030 Agenda for Sustainable Development adopted at the G20 Hangzhou Summit and other important initiatives, advancing the reform of the International Monetary Fund, stepping up cooperation on such global issues as education, public health and food security and further improving global economic governance. Fourth, we remain committed to cooperating to address climate change. Most members reaffirmed their strong political commitment to implementing the United Nations Framework Convention on Climate Change (UNFCCC) and the Paris Agreement and sent out a strong signal to uphold multilateralism and promote the international cooperation on addressing climate change, which injects strong political impetus into the 24th session of the Conference of the Parties (COP 24) to the UNFCCC. It has been ten years since the first G20 Summit was convened. The success of the summit once again proves that as the premier forum for international economic cooperation, the G20 continues to play an important role in international economic affairs. China believes that as long as the G20 members follow the principle of achieving shared growth through discussion and collaboration in engaging in global governance, shoulder the responsibility of forging a community with a shared future for mankind, stay united and enhance cooperation, we are bound to make greater contributions to promoting the sound development of the world economy and improving people's welfare. China is willing to continue with its constructive role to this end. Q: According to reports, Japanese government officials said China was suspected of having conducted oil and gas exploration on the Chinese side of the so-called "Japan-China Middle Line" in the East China Sea, and Japan has lodged representations with the Chinese side. What is your comment? There are also reports on the oil and gas exploration in the East China Sea, saying that Japan has been asking for an early resumption of bilateral negotiations on cooperation and exploration treaties in the East China Sea. What is the attitude of the Chinese side towards that? A: China's oil and gas activities in the East China Sea are all located in waters indisputably under China's jurisdiction and are therefore within our sovereign right and right of jurisdiction. The so-called "Japan-China Middle Line" is just a unilateral claim by the Japanese side. China firmly opposes it and never acknowledges it. As for negotiations on oil and gas exploration cooperation in the East China Sea, to my knowledge, China and Japan exchanged views on the East China Sea issue during the previous round of contacts and exchanges. The working teams on the two sides will follow the spirit of the consensus reached by the leaderships to conduct the relevant work. Q: We have noted that the consensus on trade issues was reached at the just concluded China-US summit. There are some differences between the press release issued by the Chinese side and the statement released by the US side. What is your response to that? A: On December 1, President Xi Jinping and President Trump held a successful meeting on the sidelines of the G20 Buenos Aires Summit and reached important consensus, which points out the direction for the China-US relations going forward. The Chinese side has issued the readout and I would refer you to that. The two heads of state reached consensus on trade issues and agreed to stop levying additional tariffs. The two sides also put forth a series of constructive proposals on how to resolve the existing differences and problems. China is willing to open its market, expand import and help mitigate the relevant China-US trade issues in light of the process of its new round of reform and opening-up and the needs of the domestic market and its people. Meanwhile, China points out that reaching a mutually beneficial and concrete agreement is the basis and prerequisite for China to take relevant active actions towards the US. I also want to stress that it is of great significance for the two sides to reach consensus during the summit. It not only effectively prevents the further escalation of China-US trade frictions but also opens up new prospects for win-win cooperation. It will not only benefit the respective development of China and the US and the two peoples but also promote the steady growth of world economy and serve the interests of all countries. Going forward, the two sides will follow the consensus reached by the two heads of state to step up consultations and endeavor to bring the China-US trade relations back to the normal track as soon as possible so as to achieve win-win cooperation. During the RIC meeting, the three leaders agreed that Russia, China and India are all major countries of significant influence and each other's important strategic partners for cooperation. Our three countries share a wide range of common interests and similar development goals and shoulder important responsibilities for the future of the region and the world. The three leaders agreed to enhance coordination, build consensus, and strengthen cooperation trilaterally to jointly contribute to world peace, stability and development. Q: Regarding the China-US summit, the US statement said that China was open to approving a deal on Qualcomm acquiring NXP. Is that something that was discussed? President Trump today tweeted that China will reduce and remove the tariffs on the automobiles imported from the US. Can you confirm it? A: Like I said just now, the two heads of state reached consensus on trade issues and agreed to stop levying additional tariffs. The two sides also put forth a series of constructive proposals on how to resolve the existing differences and problems. Going forward, the two sides will follow the consensus reached by the two heads of state to step up consultations and strive to reach a mutually beneficial and concrete agreement. As for the specific questions you raised, I will refer you to the competent authority. 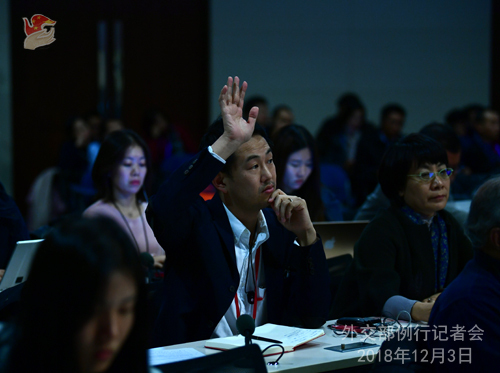 Q: Regarding the China-US summit, you said that the teams from the two countries will step up consultations. Will the two sides hold meetings in Beijing or Washington D.C.? The Financial Times once reported that Vice Premier Liu He would probably travel to Washington next week. Can you confirm this? A: Like I said just now, the working teams from the two sides will follow the consensus reached by the two heads of state to step up consultations and strive to reach a mutually beneficial and concrete agreement. With regard to the detailed arrangement for the contacts between the two sides, I will refer you to the competent authority. Q: China has concluded its rotating presidency of the UN Security Council for November. Can you give us more details on China's November presidency? A: With the support and coordination of all parties, China has successfully concluded its rotating presidency of the UN Security Council for November. 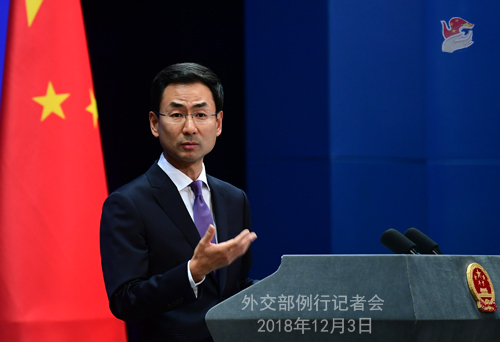 Following the principle of fairness, transparency, high efficiency and pragmatism, the Chinese sided hosted 35 meetings, adopted six resolutions and issued seven press statements by the President of the Security Council. Under China's auspices, the Security Council in November held open debates, called for supporting multilateralism and strengthening the role of the UN, moved forward deliberations and the political settlement processes of relevant international and regional hot-spot issues, and prompted discussions and actions from all parties on the UN peacekeeping operations. Under the rotating presidency, China has given full play to its role as a permanent member of the Security Council and made new and positive contributions to world peace and security, thus winning acclaim from all parties. The UN is the banner of multilateralism and the core of multilateral mechanisms. Under the current circumstances, the international community needs a strong United Nations more than ever. 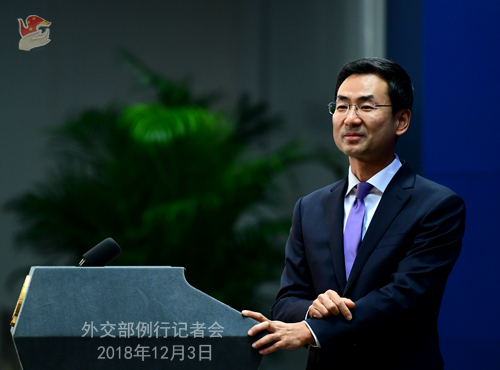 China will continue to abide by the purposes and principles of the UN Charter, firmly uphold multilateralism, actively push for the settlement of hot-spot issues and the implementation of the 2030 Agenda for Sustainable Development, and promote a bigger role for the UN in international affairs. Q: Last week, Pakistani Prime Minister Imran Khan attended the groundbreaking ceremony of the construction of Kartarpur corridor along the Pakistani-Indian border. The Indian side has also approved the corridor project. This corridor will provide a visa free access to Sikh pilgrims from India wishing to visit the holy shrine in Pakistan. What is China's comment? A: We have noted relevant reports and are pleased with this positive interaction between Pakistan and India. These two countries are important nations in South Asia, and a steady relationship between them is significant to peace and development of this region and the world beyond. We sincerely wish that they could strengthen communication and dialogue, properly handle differences, improve bilateral ties, and jointly maintain regional peace and stability. Q: On the meeting between President Trump and President Xi, the US statement said that China had agreed to designate fentanyl as controlled substance. How does this agreement differ from the previous one? What does it mean for China's policy going forward? Will you for example extradite to the US Chinese nationals who have been charged by the US for fentanyl production and what other changes will be made to Chinese laws? A: When taking the questions on fentanyl last week, I said that anti-drug cooperation is always a highlight and model in China-US law-enforcement and security cooperation. China is willing to continue to enhance exchanges and cooperation with the US in this regard. After the China-US summit, China issued the readout, which says that China will include all fentanyl-like substances into its list of controlled substance and start the procedure to adjust relevant laws and regulations. Now the relevant work is yet to be started. So regarding the specific questions you asked about, it is still too early to answer them. Q: Yesterday reports say that a far-right party won seats in a Spanish regional parliament for the first time. What is your comment? What does China think of the rise of the far-right forces in Europe? A: China and Spain are comprehensive strategic partners. President Xi Jinping just made a successful state visit to Spain. China-Spain relations are now facing new historical opportunities. At this new starting point, China would like to strengthen mutually beneficial cooperation with Spain at the central and local levels. Europe is an important party to the international landscape. China and Europe will work together to build China-Europe partnerships for peace, growth, reform and civilization and make greater contributions to world peace, stability, development and prosperity. Q: Just now you gave elaborate details about the BRICS leaders' meeting as well as the RIC leaders' meeting in Buenos Aires. The leaders from Japan, the US and India also held their first meeting there. How does China view this? Q: On the China-US agreement, many doubt that whether the US will stick to the agreement and keep its promises. Is China concerned that the US may break its promises since it has done that before? I wonder if China has a plan B in such case? A: During the summit, President Xi Jinping pointed out that the economic and trade exchanges between China and the US are close and that it is quite normal for the two sides to have some differences in the economic and trade areas. The key is that China and the US should properly manage them and find a solution that can be accepted by both sides in the spirit of mutual respect, equality and mutual benefit. 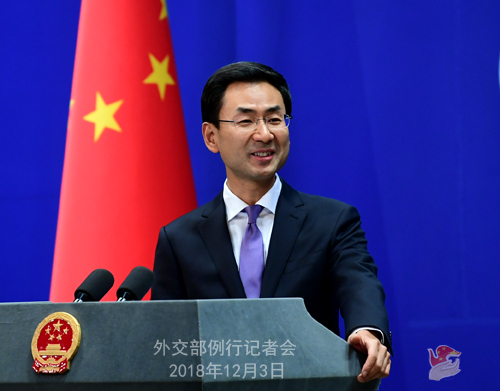 China has stressed before that we hope to conduct dialogue and consultations with the US to resolve the trade issues on the basis of mutual respect, equality and good faith. Q: State Councilor and Foreign Minister Wang Yi, when briefing the media on the China-US summit, said that China and the US are stepping up consultations in the direction of lifting all additional tariffs. Can you give us more details on this? A: The two heads of state reached consensus on trade issues and agreed to stop levying additional tariffs. They have instructed the working teams from the two sides to follow the consensus to step up consultations in the direction of lifting all additional tariffs and strive to reach a mutually beneficial and concrete agreement as soon as possible.